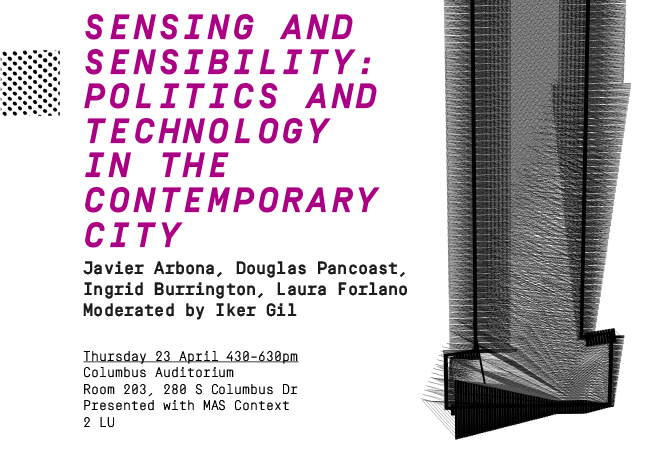 “Sensing and Sensibility: Politics and Technology in the Contemporary City” will explore the intersection of politics and technology in the territory of the contemporary city. The city and its citizens are continuously generating data through smart phones, social networks, apps, and sensors that measure any aspect imaginable. Public and private companies are tracking and collecting our data to uncover patterns of behavior. What patterns does it uncover and who owns that data? How can this vast amount of information be useful in shaping our cities? How do these technologies change how people use space? What are the unwanted consequences? The panel discussion, composed by Javier Arbona, Ingrid Burrington, Laura Forlano, Douglas Pancoast, and moderated by Iker Gil, will build upon the ongoing work of each practitioner, covering aspects of power, surveillance geography, militarized landscapes, network infrastructure, as well as ubiquitous computing technologies in urban environments. Javier Arbona is a geographer researching the spatial legacies of militarization and violence. He is currently a Chancellor’s Postdoctoral Fellow in the American Studies Program at the University of California, Davis. Arbona is working on a book manuscript titled “The City of Radical Memory: Spaces of World War II Home Front Repression and Resistance in the San Francisco Bay Area.” In addition, Arbona is a founding member of the DEMILIT landscape arts collective. DEMILIT has produced works for the Headlands Center for the Arts, Deutschlandradio, the 2012 New City Reader at the Istanbul Design Biennial, and the Art Gallery at UC San Diego. Arbona holds architecture and urbanism degrees from Cornell University and MIT, and a PhD in geography from UC Berkeley. Ingrid Burrington writes, makes maps, and tells jokes about power, politics, and the weird feelings people have about both. She’s currently a fellow at the Data and Society Research Institute and a member of Deep Lab. Her writing has previously appeared in Creative Time Reports, TechPresident, and San Francisco Art Quarterly. She lives on a small island off the coast of America. Laura Forlano is an Assistant Professor of Design at the Institute of Design at IIT where she is Co-director of the Critical Futures Lab. From 2012–13, she was a Visiting Scholar in the Comparative Media Studies program at Massachusetts Institute of Technology. Her research is focused on the intersection between emerging technologies, material practices and the future of cities. She is co-editor with Marcus Foth, Christine Satchell and Martin Gibbs of From Social Butterfly to Engaged Citizen: Urban Informatics, Social Media, Ubiquitous Computing, and Mobile Technology to Support Citizen Engagement, which was published by MIT Press in 2011. She received her Ph.D. in communications from Columbia University. Douglas Pancoast is a graduate of the University of Kansas School of Architecture and Urban Design (BArch 1991) and Cranbrook Academy of Art (MFA Arch 1995). He has worked for firms including Richard Meier and Partners, 1100 Architect, BlackBox Studio at SOM, and agency.com. 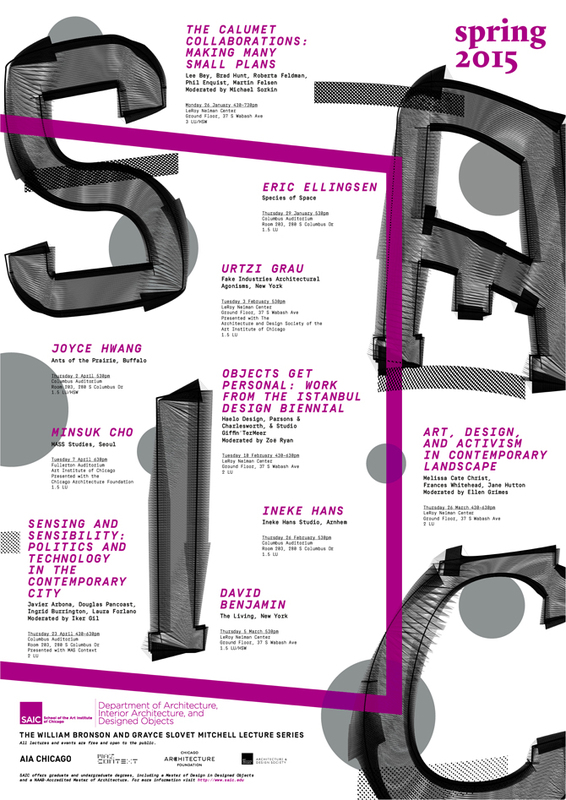 His work has been shown in the Chicago-based exhibitions Art in the Urban Garden, Mystique: Space, Technology, and Craft and Speculative Chicago; and in Scale at the Architectural League of New York and the National Building Museum, Washington, DC. His projects have been featured in Architectural Record, Architecture, A.P.+, and The Architectural Review, and in the book Young Architects: Scale. This lecture is made possible by the William Bronson and Grayce Slovet Mitchell Lectureship. When: Thursday, April 23, 2015 from 4:30 until 6:30 pm.